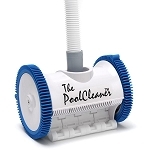 Suction cleaners rely on a pool's filter and pump to provide suction. A hose with a cleaner head is attached to the skimmer or to a dedicated suction line that was installed during the pool's original construction. The pump draws water into the filter and returns it to the pool, resulting in full circulation. These turn the entire body of water at least once a day. By eliminating sitting water, the action reduces possible build-up of bacteria and algae. 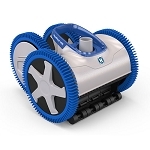 Suction cleaners require powerful pool pumps to operate properly. 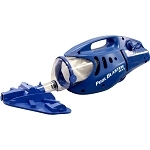 Pressure-side cleaners connect to either the pool's return line or a dedicated booster pump line. They essentially use water pressure to propel the system, and all debris is captured in the unit's head. Some models incorporate a convenient, easy to empty high-volume debris trap to capture both large and fine particles without reducing water flow. Pressure-side cleaners are especially recommended for pools that are susceptible to heavy or large debris, such as leaves.